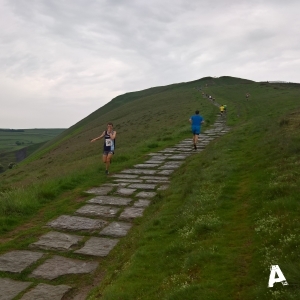 A Message from the Castleton Fell Race Organiser. A week before the race Derbyshire was in the grip of a mini heatwave. The course had never looked better, hopefully the weather would hold…surely? As I arrived home from work at 4:00pm on race night to prepare for the race, as if on cue, the heavens opened and for the next 30 minutes, Castleton was subjected to a months’ worth of rainfall! Thankfully it eased; however the deluge had saturated the parking field, and we had to make the decision to direct all competitors to park in the village, and walk up to the playing fields. Thanks to all of you who were so accommodating. Despite the inclement weather, numbers were only slightly down on last year, with 231 finishers. The race saw a good tussle between Stuart Bond and Alasdair Campbell (pictured), with the Buxton runner coming out on top with a fine time of 42m 15seconds. The women’s race was won by Anna Hoogkamer (Dark Peak), who managed to hold off her team mate, Sally Fawcett by 21 seconds. Many thanks to Stuart and Debbie from Accelerate who once again supported the race with numbers, goodies and enthusiasm! Finally, to the many volunteers who turned out in the rain to ensure that the race ran smoothly. Many competitors thanked me after the race, and this would not have happened without all of your help and support.